Mustansar Hussain Tarar is a living legend for his contributions to Urdu literature. He is a prolific novelist, travel writer and columnist. Along with this he is also an avid mountaineer and traveler. Most from my generation however remember him from his days of hosting the live morning transmission on PTV in the 80s and 90s. On March 1, 2018, Mustansar Hussain Tarar turned 79 and I had the honour to be part of his birthday celebrations here in Calgary. The event was organized by Sadaf Siddiqui who is one of the biggest fans of Tarar Sahab that I know! We met at the Crowfoot location of the Calgary Public Library and had a great time discussing our favorite works of Mustansar Hussain Tarar. The event kicked off with Sadaf explaining to us what "Takeya-e-Tarar" means. It is a meeting that Tarar Sahab holds himself every morning after his walk in Model Town Lahore discussing his writings and any questions that his readers have regarding the work. The event is now replicated around the world with fans getting together and discussing Tarar Sahab's writings. We had been asked to bring some of our favorite pieces from his writing and share why they were special. It was lovely hearing such diverse pieces of writing from Tarar Sahab's work covering history, travel, religion and humor. 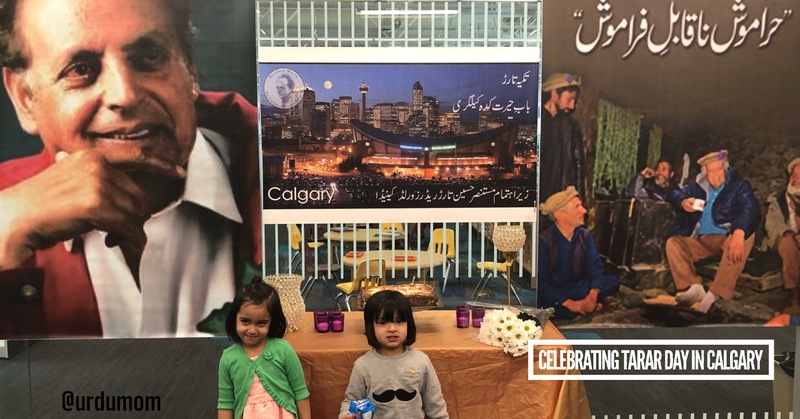 Sadaf and Ayesha, the two ladies behind the successful event, also launched Mustansar Hussain Tarar's new book "Haramosh Naqabil-e-Faramosh" in Calgary. I chose a piece from "Tarar Nama 4" which is a collection of Mustansar Hussain Tarar's newspaper columns discussing history and the need for us to own the history of the subcontinent irrespective of religion. I felt that was an important message of tolerance in the world of today. In the end we asked the youngest participants to cut the birthday cake, hoping to pass on the passion and love of Urdu to the next generation. I feel it's important to recognize and honor writers while they are alive. Such events help promote the love of language and get like-minded people together. We are lucky here in Calgary that our public library carries a huge collection of Urdu books. Moreover many book stores in Pakistan will now ship their books anywhere in the world. There are many books available online also however I'm always hesitant to recommend anything that does not give benefit to the publisher and the author. Are you a fan of Urdu literature? Why don't you arrange an event to celebrate a favorite author or a book? I love how you are keeping alive your language and passing it on to the children in so many ways.